The following letter was sent by Capt. 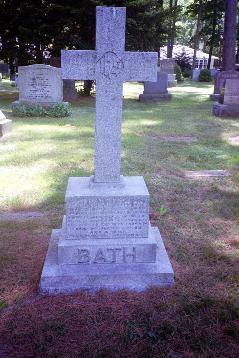 E. O. Bath (15th Battalion, 48th Highlanders) to his mother Ruth, Mrs. Percy Atkinson Bath of Belaire, Oakville, Ontario. At the time he had been released from German captivity due to poor health. Tod died in London two months later (1918), of influenza complicated by gas wounds. His remains were returned to Canada and interred at Oakville. We got back from our six days cruise yesterday, we had the best sailing we have had yet but the weather was pretty bad most of the time, being cold, blowing a young gale and thunderstorms every couple of hours, a beauty caught us one night in the middle of a fairly large lake it was pitch black + as we were surrounded by buoys + shoals we had to drop our anchors; a little while later the dingy swamped + did a most successful escape stunt leaving us with half the painter + early in the morning one of our anchor ropes parted, we succeeded in getting the other anchor aboard although there was only one strand of the rope left hanging on to it + beat it under bare poles. I am afraid the dingy is a gone loon but we know pretty well where the anchor is + as it is only in about six feet of water we hope to recover it next time. Pete Fessenden (?) + I have put in applications to live at Haarlem for the winter but I dont know whether they will be granted or not yet nearly every body is trying to get away from here now + they certainly wont let us all go. I will try to remember a few more pleasant incidents of prison life. Poole and Medlicott were caught the third day after the wire jumping stunt were brought back + given two weeks jug in the meantime we were fixing up another stunt of dressing up as russian + french orderlies + going out in the early morning to feed the pigs which were just outside the second wire but in view of the sentries + two days after they were released we pulled it off. We got up about five oclock put on our civilian kit with orderlies uniform over it succeeded in dodging the sentries in the building + got into the kitchen where we hid our rucksacks under the pig food, a german came in while we were there but didnt notice anything wrong as soon as he had gone the six of us poole, medlicott, voelker, Hilpern, pramberger (the little rusky) + myself walked out with big buckets of pig food on our shoulders said good morning to the sentry who very kindly opened the gate + we smiled a little smile of relief + walked into the pig pen, once there we hid behind the pigs slipped off our uniforms + got out the back without being noticed then we divided into two parties + went in opposite directions. Hilpern, pramburger + I got to the road + walked back in front of the camp greeting the same sentry again as we went by. We walked quietly on until we were out of sight of the camp + then when the way was clear beat it hell bent for election to a wooded hill we went up hill + down dale through the thick woods for about ten miles when we came to open country + there were a lot of farmers working in the fields so we picked out a thick spot + lay up for a day soaking wet + very cold at 10 a.m. we had a biscuit + a raw oxo cube at 4 p.m. a biscuit + piece of chocolate, very thirsty, an old boar paid us a visit we didnt like it’s looks at all fortunately it scampered off on seeing us, 8.30 biscuit, raw oxo cube, + a tot of rum start walking at 9 p.m. have great difficulty in finding roads through woods finally get to open ground + go across country, arrive at a small river about 3, a.m which we drink nearly dry come to another river at daylight which we wade, the farmers were all out working but there was no cover in sight so had to keep on finally lay up about 8,30 in small clump of trees not very good cover but the best we could find, raining hard, cold as blazes p’s feet beginning to get blistered same rations as the day before, position 2 kil. n (?) of sielen , start at 9. p.m. pass through Buhue (?) whistling “der vaterland” Very bad road to natzungen, passing through a woman shouted to us to halt, went like the devil for about a mile + then lay up in a field to see if we were followed. after about 20 minutes start off again, p. in agonies with his feet + thirst + keeps saying, “Oh gentlemen, gentlemen do not take such long steps + I can keep up with you”. reach a wood just before daylight where we decide to lay up. Nearly walked on a family of boars who started grunting + snorting which didnt make things more comfortable for us but we were too tired to pay attention to them + flopped where we were, it had rained all night so were still soaking wet. at daylight we went further into the woods for safety + found exactly what we wanted most, a small stream, we had our little spirit stove going hard in about five minutes + soon after had a heap big meal of two cups of thick cocoa + a biscuit heavens how good that hot drink was it was the first we had had + we had been wet ever since starting, at noon + in the evening we had hot oxo + a biscuit + started off again a little after eight it rained very little that night + we found our roads without much difficulty so managed to cover a lot of ground + daylight found us opposite driburg (?) on a high wooded hill, when we lay up we didnt notice that there was a road + a few houses just a little further on, during the morning some youngsters came into the woods quite close to us + started playing hide + go seek, the little devils were all around us but fortunately a bad thunderstorm came up which drove them away before they had seen us, about 5 p.m. we were so wet + cold that we couldnt lie still any longer so we started off keeping in the woods as much as possible at eight oclock we stopped for something to eat + then did physical torture to try to get warm until it was dark enough to go on the roads, we passed through Altenbelten (?) just after starting but took the wrong road out of the town + had to come back + get on the right one after following it for about a mile it ended in a blank wall of trees + very thick underbrush we tried to go through it but found it impossible as we couldnt see six inches ahead of us so we had to come back we spent three hours looking for a road going in our direction but had no luck, at about one oclock the rain started coming down whole water so we gave it up in dispair + crawled under a little bridge to wait for daylight the three of us lay on two coats + had one over us (some crush!!) + we shivered till daylight. Hilpern + I couldnt sleep at all in spite of the fact that we hadnt had more than one hour’s sleep any day we had been out but prambergers bad feet took the heart right out of him + he just flopped + went to sleep whenever we stopped + we had to take his boots off for him + do what we could for his blisters. Just after daylight I noticed something moving at my feet + looked down to see one of my boots floating away, the rain during the night had started the stream running + we were lying in a couple of inches of water but were so cold + wet that we hadnt noticed it after a cup of cocoa + a biscuit we started off through the woods about noon we came to open country again but it was raining so hard that no one was out in the fields so we carried on + got a few mangles (?) on the way which we put under our belts about four oclock we came to a fairly large stream in the woods where we stopped for a couple of hours + shaved each other had a good wash + a big meal + then started on again + kept going until five oclock the next morning. during the night we almost walked slap bang into a german training camp about 25 miles north of paderborn (?) it happened to be just ten oclock and the “lights out” bugle blew when we were not 50 yards away we made a big detour + after a couple of hours struck a good road which we followed till 5 oclock we were so dead beat that we could scarcely stand having been on the move about 21 hours out of the 24, practically no sleep for 5 days + nights + soaking wet + cold ever since we had been out. At five oclock we were looking for a place to lie up when a woman passed us on a bicycle it was still pretty dark + we hadnt seen or heard her. as soon as she was passed we made tracks for small wood but as it got lighter we found that it was not thick enough for our purpose so decided to try a bigger one across the road just as we were crossing the road we heard a wild shout of Halt!! + saw two men trying to jump off their bikes + put their rifles to their shoulders at the same time with the result that one of them took a dive into the mud he picked himself up again told us to put our hands up + then asked us if we had any papers + what we were doing, pramberger spun (who spoke perfect german) spun them a long yarn about our going to work on our cousin’s farm at the next town but it wasnt good enough + we had to come along then when we saw the game was up we told them who we were they took us to a little pub + locked us up. The Landlord was very decent + took our clothes to the Kitchen + tried to get some of the mud off them. fortunately I had a couple of hundred marks in german money in a secret pocket of my purse so I got some of it out + gave it to the landlord + he brought us a dozen eggs each + some meat + vegetables + we ate steadily for about an hour. at noon a couple of sentries arrived + took us by train to the men’s camp at sennelager (?) where we were kept in the guard room until the sentries arrived from münden to take us back. we arrived at the camp at midnight were taken to the guard room, thouroughly searched + all our escape kit confiscated. just before we were taken to the lock up room I asked if I couldnt take some food with me, the officer gave me permission so I picked up my old civilian cap filled it full of biscuits, chocolate, + a compass + walked away to the lock up where we found Voelker + poole they had been caught the third day, medlicott had run for it when they were caught + was still out. The next day I sent my compass + hat into the camp to be hidden for further use. we spent most of the morning on the carpet being cross-examined but they didnt get much out of us. Medlicott was brought in later in the day he got as far as munster where he was collared by a detective. we were all kept locked up for six weeks. I had two court martials during that time one before the court of appeal on my six months charge which ended in our being given the same sentence again + the other for our last show for which we were given seven weeks but in view of the fact that we had been kept locked up for six weeks without trial the court generously (?) allowed that to count for one week of our sentence which meant that I had 7 1/2 months to do we were let into the camp again about the middle of October + on the 22nd Medlicott, Poole, + Oliphant got away by cutting a hole in the wire in broad daylight with a sentry not 25 yards away on each side of them. Med, who did the cutting would wait till they both had their backs turned + then would run up + snip a strand then come back + wait for another opportunity, it was one of the most dare-devil stunts I have ever seen though not as bad as some he pulled off later. when they had a hole big enough to get through they made a dive for it, cut the outer wire, crawled through a hedge + were out of sight in ten seconds. Hilpern + I had our things ready in case it was a success + about 3/4 of an hour later were waiting for an opportunity when the sentries had their backs turned (they hadn’t noticed the hole at all) when suddenly the bugle blew for roll call, we were in civilian kit with greatcoats so had to get up to our room change our clothes + hide our escape kit + be on parade in about two minutes. Naturally we were a few minutes late which brother bosh duly noted + beamed at us as we came on (damn’em) A Russian whom we had suspected for some time was seen coming out of the commandants office just before the bugle blew, a little while after roll call the commandant sent for me + I got my marching orders for Wesel. I had to pack everything + have it searched that evening + the following morning about six oclock I was escorted to the guard room where everything I had on me was searched very thoroughly with the exception of a pair of gloves containing a compass which I laid on the table right in front of their eyes + the heel of my boot where a map was carefully tucked away. I had hopes of being able to jump out of the train somewhere near the frontier but as I was made to travel in a compartment full of german soldiers I had no opportunity. 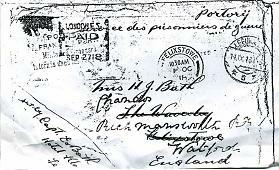 I arrived at wesel about 8. p.m. + after smuggling my things through another search was taken to my cell where I met Barry. The cells were much more comfortable than I thought they would be + life on the whole there was not so bad <at first> with the exception of the monotony but after I had been there a couple of months it got much worse. The citadelle was about 3/4 of a mile in circumference surrounded by a dry moat The inside wall was about 40 ft high the outside between 15 + 20, inside the citadelle were barracks, powder magazines etc. a large grain warehouse + two prisons, one for deserters (whom they used to bring in everyday) + the other for us + of course the whole place was bristling with sentries. I think I deserve a couple of good marks for this long screed even if it is somewhat overdue. I will carry on with the life at Wesel next time. My hand is nearly “broke” with writer’s cramp now. There is still no news of repatriation, isnt it the limit. The latest news from germany re prisoners is bad, the boshes are stealing their parcels wholesale now, the poor devils will be in a bad way without them. I cant understand why they let that doddering old fool Newton carry on he has absolutely no sympathy for the prisoners + is incompetent of doing anything even if he had, but he manages to see that the germans get the very best of everything in England. If you want to hear the best flow of language you ever heard in your life, get a Kriegsgefangener (?) on the subject of Newton. 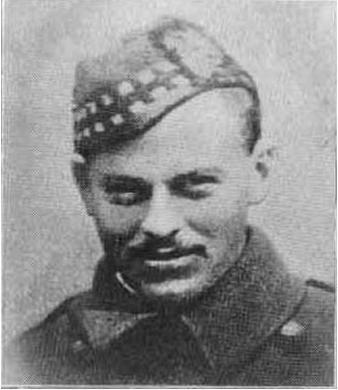 Lt. Harold William Medlicott RFC, was later shot by the Germans after numerous escapes attempts. See the Medlicott Family site for more information. Poole later made a successful attempt to reach neutral territory.